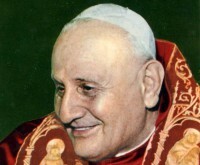 Angelo Giuseppe Roncalli became pope in 1958 when he took the name John XXIII. He reigned until his death in 1963 and was declared a Saint by the Catholic church in 2014. Pope John, originally from Lombardy Italy, bypassed the traditionally required second miracle by Pope Francis and was unanymously declared a Saint by the College of Cardinals. He was considered to have led a virtuous, model lifestyle and actively encouraged equal rights. During World War II his intervention saved many Jewish lives, using his influence to prevent people from being moved to death camps and even liberating concentration camps. Today he is know as 'il Papa buono', the Italian for 'good Pope'. Pope John XXIII's embalmed body can be found in St Peter's Basilica in Vatican City under the altar of St Jerome, in the basilica's central nave. The Basilica is open every day from 7.00 to 19.00, April to September and from 7.00 to 18.00, October to March.